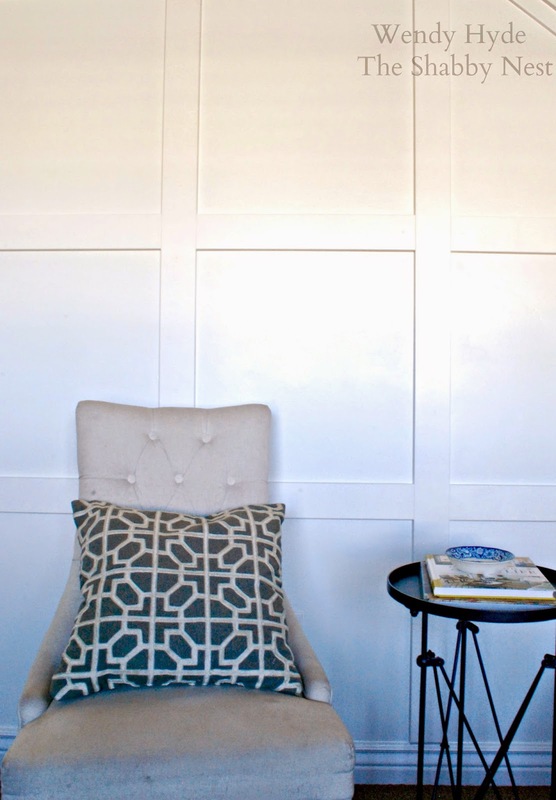 I'm so excited to share my newest crush with you today: my living room wall. 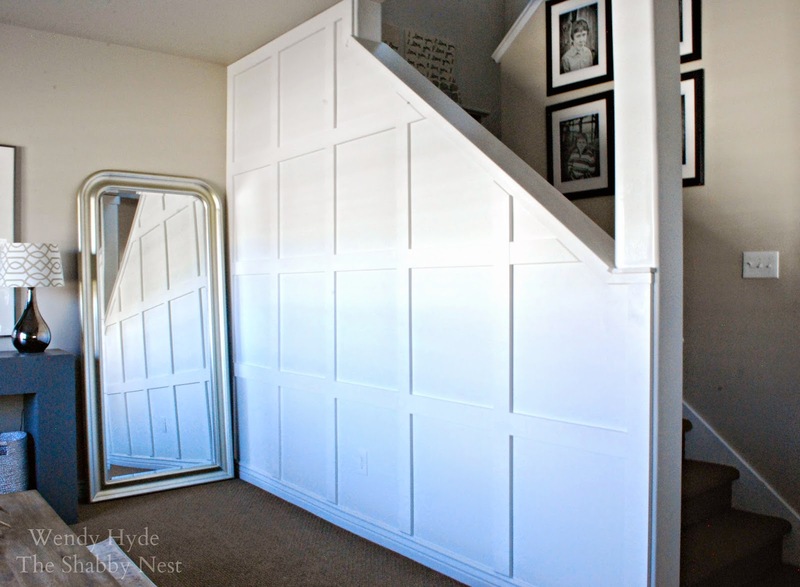 I have been in love with square wainscot for several years, but because I have been renting for the past few years, I haven't been able to add any to my house...until now. 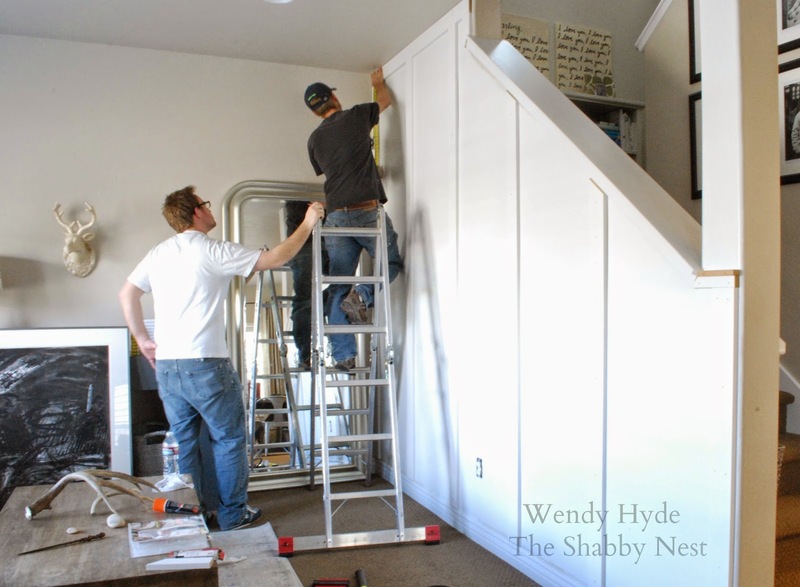 Last June, when I was just in the process of looking for a new house, I wrote about how I was daydreaming of adding square wainscot somewhere in my abode. And when I purchased Hydeaway Cottage, I knew exactly which wall I wanted to dress up. Here's the funny little wall to which I wanted to add architectural interest. In this photo, I had already given it a couple of coats of semi-gloss paint in Sherwin Williams Ceiling Bright White in preparation for the wainscot. It's a staircase wall, but rather than having a railing, it had a pony wall with a supporting post that was really less than attractive. So I asked my friend Tim of Millworks Woodworking (the very talented hubby of one of my adorable interior designer coworkers) to come and put it in for me. It only took a few hours on a Saturday, and they were all done. And I was officially in love with my wall. It adds SO MUCH to the living room space in my house. 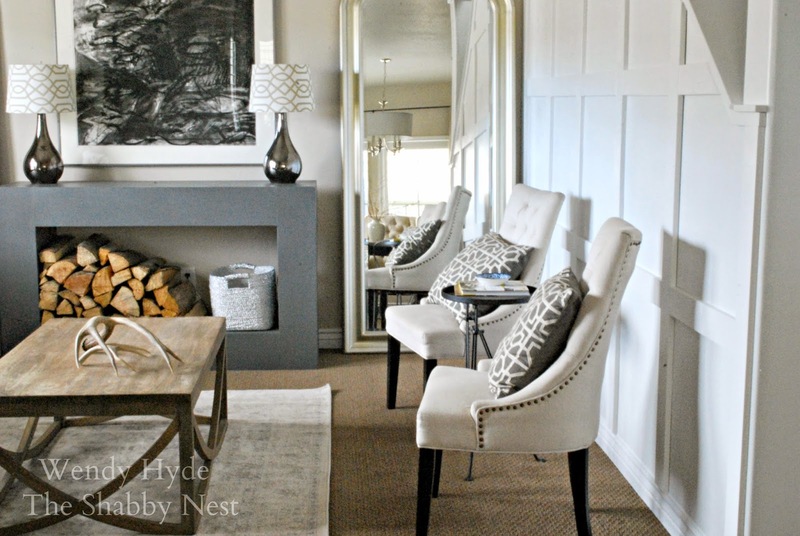 It is the first thing you see upon entering Hydeaway Cottage and is really a reflection of my taste! The semi-gloss paint reflects the light so beautifully with its delicate sheen. I am absolutely smitten. I received a small discount on my wainscot in exchange for this post, but the opinions expressed are 100% mine. 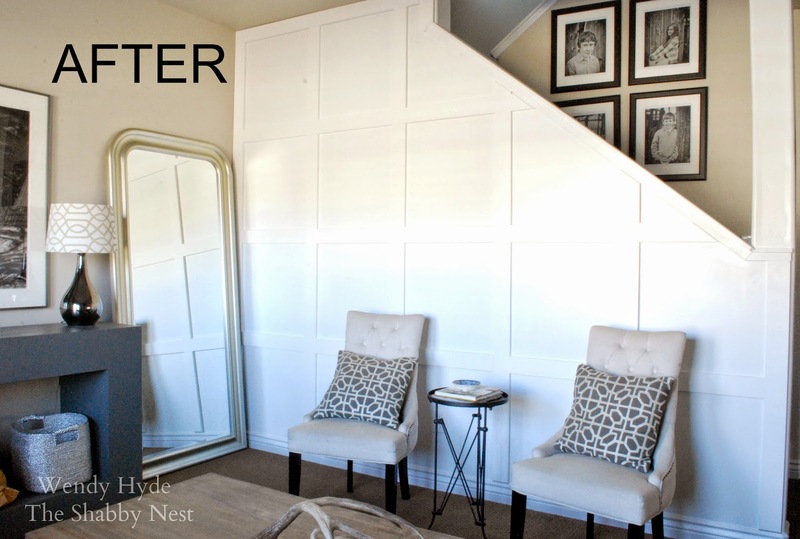 I LOVE my new wainscot! I love it too! In fact we are currently having wardrobes built across one wall and the fronts are going to be exactly like that. It really does add so much more interest. Love your decorating style! Such a great project. 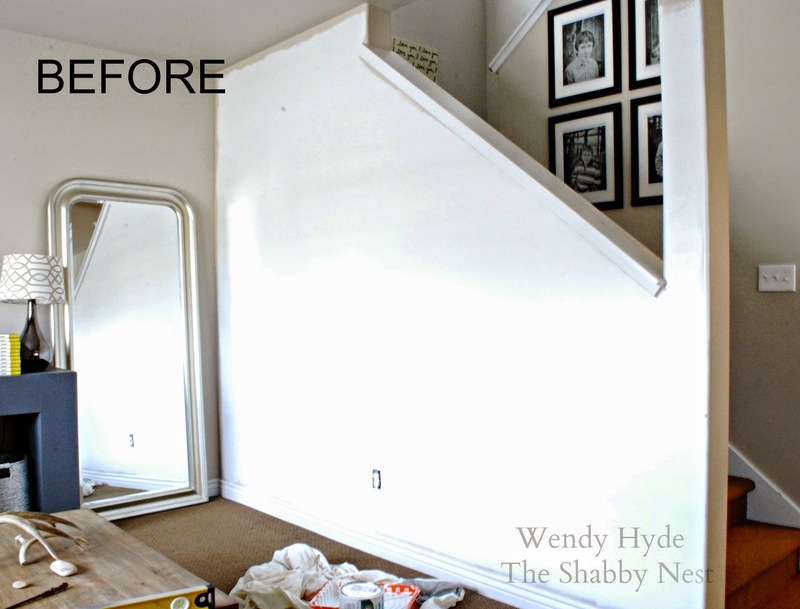 It totally changes the look of the space. Love it. It really does look lovely and it makes such a difference in your space!